Tone 12 is the Day of Understanding. A Transformation to Higher Consciousness of our own Nature is drawn together. Tone 12 energizes our capability of retrospection. Elements of knowledge come together to become a new and functioning whole. Knowledge Understood turns into Wisdom that seats in the Heart. Star/LAMAT is the Day Sign of “pure luck.” Rabbit, the Cherokee Day Sign, is known as LAMAT’s totem. The Rabbit is a symbol of sexuality, reproduction, and multiplication, with boundless energy to create from the Overflow of Love. With Rabbit’s energy whatever we focus on is multiplied to abundance. This is a great blessing and great responsibility. This is a day to Count Our Blessings for the Love of Mother Earth. A Portal Magnifies our Retrospective Vision for Understanding. 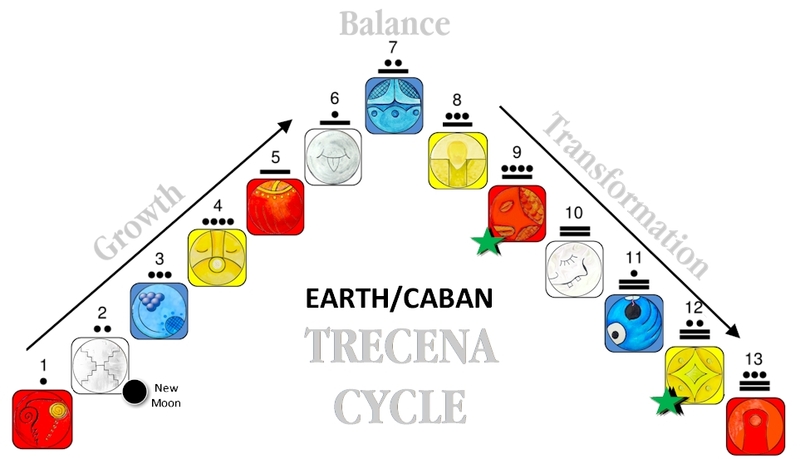 Lifting the veil to all dimensions, the Earth/CABAN trecena Fulfills our Discovery of Mother Earth and the Love and Beauty that has surrounded us in every breath. Star/LAMAT resides in the South, the direction of Relationship. Through the mutual exchange of Love, we can Realize the Power of our Unity in Love. Star/LAMAT represents Human as the Personification of the Light of the Creator. LAMAT’s totem, and the Cherokee Day Sign, is the Rabbit. The Rabbit is a caldron of the Creation of Love. We were born the Scion of the Supreme Creator of Unconditional Love. In our own Intention to Love, we become a Light unto our Self, capable to generate our own Light. We are born Stars of a Greater Star. Shining our Love we are Imitating the Love of the Creator. Just as Human is drawn to the Light of the Sun, so are Human’s Spiritually Drawn to the Light of Unconditional Love, no matter where it shines. Human recognizes from the Heart the Divinity in the Presence of Unconditional Love. We Know that the most gracious acts of Love are not the product of our Human Nature. We recognize something Higher, even when someone holds the door. We see the Unseen Love in their acknowledgement of us. Love holds such Power that even the smallest Spark will always be seen as Divine, even when we are unconscious to see it – somewhere within, it raises our Faith in one another. This was the Gift of Light we were given in a single Spark of the Creator. Even in our lowest state of consciousness, we were deemed worthy for the Creator’s Light to shine in us. The glyph includes markers of the 4 directions, symbolizing that our Light was meant to shine equally all around. Our Love was meant to shine beyond the Humans who Love us back. Neither were we meant to shine more Light on those who don’t Love us back. We are meant to Love Unconditionally, accepting Relationships exactly as they are. Star/LAMAT is completing an important Understanding in the 9th uinal that intends for us to Complete a Transformation through the Vision of Human Shining from Above. Number 9 calls on our Patience to see the Bigger Picture. Our Patience has been tested and by Divine Intervention, we’ve been forged by the Fire of the Creator’s Love. Like Venus’ first appearance as the Evening Star, through a Portal to see beyond to the realm of Spirit, from Above we can see the Light that Shines from us. We can Feel the Truth that as small as our Light might be, compared to the Light of the Sun, we are Bright Enough to shine a way. A single Spark of the Creator’s Light led Kings and Shepherds to the birth of a Savior. When we receive Unconditional Love, we Know someone saw the Light in us. Even the small Light of someone opening a door, we Know we are Seen. The Elders always say that Everything wants to be Seen and Acknowledged. Every Human longs for a Light to illuminate the best of who they are. Why else would we work so hard to hide our limitations from one another. When we are unconscious of the Divine Light within, we seek to prove our Light by worldly measures. In projecting a false light, we can never be seen. We can never be Loved for who we are. I’ve thought about the influence of the small kindnesses Human’s extend to one another and how important it is to Harmony and Happiness. Today, a smile from a stranger at the grocery store shined a Light of Oneness. One smile can generate the Light of Divinity. What a dark world it would be without the small Sparks of Love we exchange each day. These experiences reflect the Light of a Divine Intention to Love. Star/LAMAT can help us see how the smallest Spark of Love will be Multiplied to Abundance. The Human ego attempts to shine a light. Even when we are lost in our illusions of powerlessness and fear, we try to look like we’re happy. We can be ashamed of our own darkness. We can never wholly know what challenges may be part of another Human’s experience. Our Human eyes can’t see it from the outside. Illuminated by a Vision from Above, the one thing we can always Know about one another, is our common longing for someone else on Earth to see the Light in us. In our lower consciousness, it manifests as a false light of superiority. We are worthy to be forgiven, even in our unconscious ways of grasping for the Light of Love. When we see it in our Self, it’s never too late to go back and share the Truth. We can manifest our Light in either the Above or the Below. When there is no way in the realm of physicality to return to someone to offer an apology, the Creator’s Spark can manifest an exchange of Light through the Ether of Spirit. The Creators Expression of Love is the Light that reaches into the Infinity of the Universe. Master Number 999: The 9th day of September, the 9th month, in the 9th uinal, reflect the Master Number 999. Numbers represent a language in the Universe. Numbers hold the integrity of their meaning for every Conscious Being. The repetition of numbers appearing together amplifies their Intention and Magnifies their Influence. Number 9 resonates with the Universal Spiritual Laws, a higher perspective, influence, benevolence and altruism, non-conformity, leading life as a positive example for others, influence, a higher perspective and expansive viewpoint, duty and calling, strength of character, philanthropy, humanitarianism and lightworking. Number 9 also denotes endings and conclusions. Angel Number 999 brings a message that certain aspects of your life are coming to a close and/or an important phase or cycle is ending. Today, September 9, a New Moon rises in Virgo. Virgo is an Earth Sign and Guardian over the Harvest of Mother Earth. Today the heavens shine a Grand Trine of Earthly Signs, symbolizing a Divine Trinity of Heavenly Bodies. (Barbara Goldsmith explains the “Lucky” Earth Trine in her Forecast on the Astrology Page.) The Lights in Heaven reflect lunar, planetary, and universal cycles of influence and vibration. All the Heavenly Bodies in motion create the Vibration of the Universe. As we are coming to the completion of an Understanding of our Self as One in the Song of Mother Earth, so has the world around us been completing the Wisdom of an Experience. This is an Ending and a New Beginning. As the Sun sets on 9 Star/LAMAT, our time has come to Shine in the Darkness. A Divine Intention to imitate the Creator’s Love can be Multiplied to Abundance. All we have to do is ask a Divine Agency to help us See this Divine Light within our Self, and Equally through every Human around us. We can Ask to See how the Loving Arms of Mother Earth are always wrapped around us. We can ask to Know in our Heart that every Prayer to Know the Creator’s Love will receive the Justice of an Experience of Believing, a Light so bright that it only takes a Spark. Our Divine Justice guided by LAMAT is that our Knowing and Understanding will Overflow and be Multiplied, Amplified, and Magnified to Abundance. To all my relations, may we Realize the Power in shining our Light Equally all around. May we Know that it only takes a Spark. May we see how Easy it is to give everyone a Spark. May we see that when ALL our Love is focused in one direction, we overlook the many many others who need a Spark too. May we see how Easy the Creator made it for One Human to make a difference, just by Seeing Each Other. When we see the Darkness all around us, may we Know our Time has come to Shine, and that this was the Divine Purpose of our Creation. May we shine the Light of Unconditional Love back to Mother Earth. May we reflect the Mother’s Compassionate Love onto all the pieces and parts of her that reside within Human. May we Acknowledge the Light we share with One Another as a Dynamic Experience of Love in the realm of physicality. In Loving each Other we are Loving Mother Earth. May we give thanks for a planetary Harvest of Love. May we begin again in a New Mission to focus on, See, and Acknowledge, the Light in the Whole of Humanity so it may be Multiplied to Abundance. THE CHILDREN ARE OUR HOPE FOR THE FUTURE: “Ms Liz’s Allies” shares the Divine Insights and Intentions of 4th Graders, learning early how their Love can change the world. I’m grateful that for all the Blessings of Mother Earth that we fail to Acknowledge, our Love shines just as Bright in the Intention. Galactic Tone 12: Understanding. This number’s energy is a gift of great capability of retrospection. It is this ability that allows Twelve to connect disassociated parts into a (new) functioning whole. The energy of Twelve is that which presents a new piece of understood information or accumulated experience to be applied. Thank you Debra – this has been a very powerful Trecena – very enlightening, with a lot of illumination into the dark. I understand Caban much better now. So Ian Lungold was born in the Toj/Offering Trecena – yes, that makes a lot of sense – it really showed in his work! Great that you would be on your trip on his Mayan birthday – yes. 12 Ahau makes so much sense too – what a combination and how amazingly it manifested in Ian in practice. 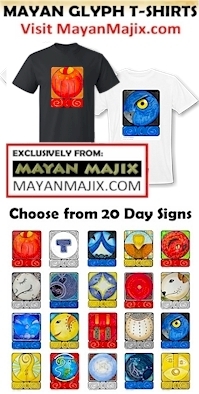 The Mayan calendar is truly a human calendar on so many levels – may many, manym many people discover it. Thank you Jacques, There HAS been a lot of darkness to work through. Both of the last trecena’s have felt like unknowns. We can always count on the energy of Earth to bring understanding. Debra, I’m just now starting the habit of reading the replies to your daily calendaring and be more a part of the community you have here. This whole process of considering the idea of making the Pilgrimage with you has deepened my journey of life through the calendar. I appreciate the mutual journeying as we follow(ed) the way of the Jaguar (& Heron) where each of us had openings. I thought I’d take our conversation to your blog here rather than the one on one conversation, which we can continue privately as needed. I am with you as you make the pilgrimage whether I go physically with you and/or in spirit. I feel the importance of tending to other choices I’ve made that are currently occupying my attention as priority at this moment. . And I’m still open to whatever possibilities open up. I believe all of your community is with you all the way. So even if it means a solo physical journey, you are never alone. We are with you. I’m sure you know that. You are doing this for all of us and beyond!